I had considered a photo montage of some of my plants with heart-shaped leaves as a Valentine's Day post, but since the topic was covered so well yesterday by Mr.Subjunctive at PATSP, doing so seemed a trifle redundant. 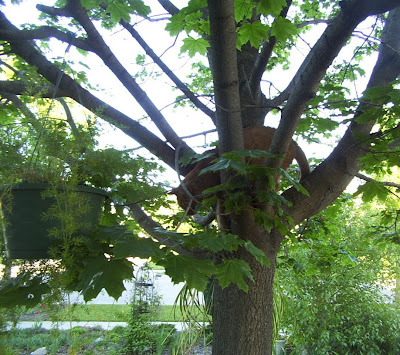 So, because I haven't done a pet post for a while, and I'm also jonesing for spring in the worst way, I thought I'd share some pictures of my cats playing in the trees during the warmer months. Keeping things on topic, there are some houseplants in two of the pictures. 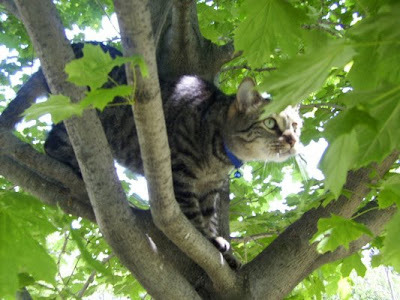 The fearless and intrepid Peppermint in the Norway Maple (Acer platanoides) in our front yard. The considerably more cautious Luke in the same tree. I had hung an Asparagus sprengeri and Chlorophytum on the branches so they could summer in the partial shade. 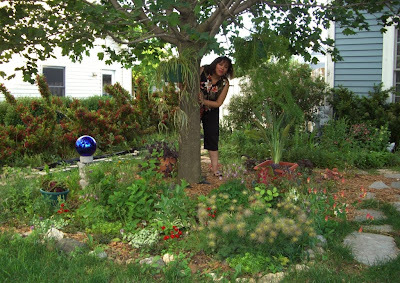 Your considerably less intrepid, but equally fun-loving blogger, behind the same tree. This one looks better in its larger version, when clicked. In addition to the plants in the trees, my Strelitzia reginae and Tradescantia pallida were enjoying their summer outdoors on the ground. Spring cannot get here soon enough for me, and several of my plants as well. Well. You know, I only showed pictures of ten plants. I think I left room for elaboration. Interesting to see your whole face, though. I wasn't sure if you'd been hiding it on purpose, or just didn't have pictures of yourself, or what. I just happen to really like the pictures with my face behind the Cissus; my husband and I agree that they suit my personality. And they go well with the name of the blog. I had pretty much given up on the idea of anonymity on the internet a while ago, even before my husband put together the family website. It bothered me for half a second, but only because I'm kind of shy, not because I was worried about my safety or anything. I know you have very good reasons for being anonymous, including family issues. I have no idea what MBT's story is, either. I'm having some doubts about showing my face as well, at least under this name - the chances I'm found by anyone who knows me IRL are very small (since I don't even write in my native language), but still I'd rather not be recognized by potential future bosses and colleagues. Spring would be nice, I agree. As would be a garden.